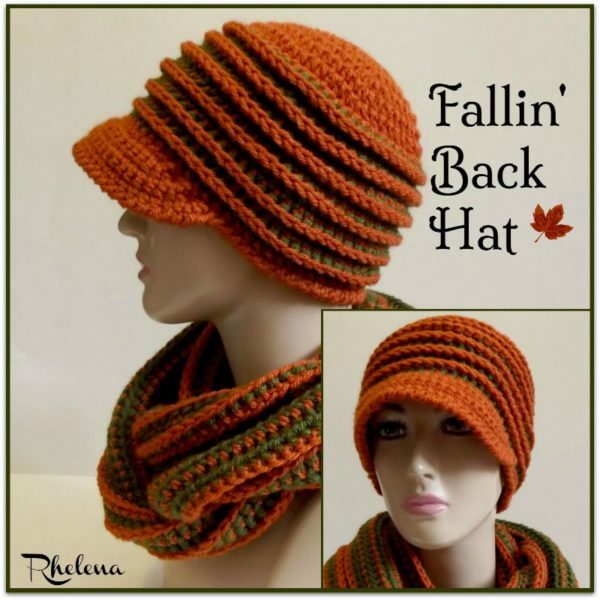 As promised, here is the crochet hat pattern to go along with the Fallin’ Back Cowl that was published a few weeks ago. The hat is easy to crochet, and can be crocheted in one or more colors. I chose fall colors for mine, but choose any color to match your wardrobe or winter coat. The hat covers the ears and also keeps the sun out the eyes. Thus, it’s perfect for those cold winter days when the sun likes to bounce off the winter snow. As with most of my hats, this is designed to fit an adult small, but with a few more increases at the crown, you could turn this into any size hat that you like. And, feel free to crochet this with or without the brim as well. Gauge: Just under 2″ over first 2 rounds. Finished Size: Laying flat it measures 10.5″ across by 6.5″ high not counting the brim. It’s easy to crochet to any height. Rnds 11-20: Rep rnds 9-10 until you have reached a desired height ending with rnd 10. Rnd 21: With CA, ch 1, sc in same st as join and into each st around; join with sl st in first sc. FO. Row 1: With RS facing, Join CA to 23rd st from where you fastened off. Ch 1, 2 sc in next st, (sc in next 2 sts, 2 sc in next st) 6 times, sl st into next st. Turn. 26 sc. Rnd 7: With RS facing, Ch 1, rsc evenly around; join with sl st in first rsc. FO. Purchase and ad-free PDF here on Ravelry and Craftsy. 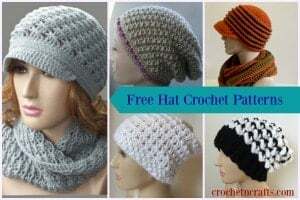 Visit Crochet Patterns Bonanza for more FREE Women’s Hat Crochet Patterns. was waiting for this. i really like the cowl and could see there was a hat to match. thanks!!!! I am almost finished,he’d, but have a question…are we supposed to do the reverse sc just on the brim, or around the entire hat? You’re welcome and thank you for the feedback. :) The reverse sc is worked around the entire hat. You are quick! Lol thank you. Just finished the hat. Sooooo cute! I went to Ravelry to get a PDF of the hat, but I can’t find a PDF of the cowl. Is there one anywhere? If you scroll down to the bottom you’ll find a green print friendly button. It will allow you to print a clean pdf. I just finished this hat- the third hat I’ve ever made, and it came out great! I even made it bigger by adding 2 more increasing rounds of CA at the beginning, and 2 extra rows before the brim. Also made the brim a little wider to accomodate the increases. Though it took a little number fiddling and trying the hat on a lot to get it right, I’m so pleased with it! Thanks for a great free pattern. I dont understand when to use what colour?? Marilyn, would you mind sending a picture of what it looks like to [email protected]. Without it I’m not sure I can help you. If I have weight 3 yarn. What size hook would you recommend for this project? :) Thank you so much! I normally use a G for a #3 yarn. However, I cannot say how it will turn out on this pattern in regards to size. You will have to make adjustments.